The aims of this journal are to enhance the international exchange, extend the academic influence and service the economic construction. It reports principally the achievements of materials science and engineering in China, and publishes some foreign contributions with a proper space, putting the stress on the original papers, review articles invited by the editor, letters, research notes with novelty as well as brief of scientific achievement, covering a broad spectrum of materials science and technology, encompassing: metallic materials, inorganic nonmetallic materials, composite materials. The journal published papers from 40 countries all over the world with a publishing rate of about 25%-30%. The journal has been awarded the excellent periodical in China, and its articles are abstracted/indexed in SCI-Expanded, EI, CA, SA, JICSJ, RJ, CSA, MA, EMA, AIA etc., PASCAL web. ISI web of Science on the Research Alert?, Materials Science Citation Index?, Current Contents?/Engineering Computing &Technology. The full-text electronic version ofthe journal (PDF format) can be found in http://www.jmst.org. The journal has been famed for a window for watching the trend of materials research in China. The monthly journal is distributed worldwidely. 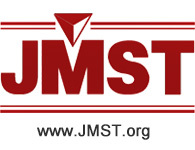 For subscription of hard copies, please contact our editorial office: JMST@imr.ac.cn. Welcome your contribution and subscription.